Chemistry faculty is one of the oldest in Dnipro University. Although officially the date of the Faculty foundation is 1933, training of chemists at the University has begun from the first day of its foundation (1918). At the establishment of the Faculty there were prominent scientists - Academician Lev Pysarzhevsky (1871-1938), founder of Dnipro school of chemistry, creator of electronic chemistry, academician Dmitry Konovalov (1856-1929), one of the greatest scientists in physics and chemistry, discoverer of famous laws of distillation of liquids (laws of Konovalov), academician, Hero of Socialist Labor Alexander Brodsky (1895-1969), founder of well known school of chemistry isotopes. In the period before the World War II, in close cooperation with scientists of the Institute of Physical Chemistry, USSR Academy of Sciences, acting in Dnepropetrovsk, the Faculty practiced studies of electrochemistry of solutions and the theory of catalysis (Professor V. Reuter), mechanisms of organic reactions (Professor F. Berezovska) were carried out to develop new methods of physicochemical analysis (Prof. A. Zanko, prof. V. Stefanovsky), the search for inhibitors of metal corrosion (Professor M. A. Rosenberg). After the World War II, the faculty began important research the chemistry of epoxides (Department of Organic Chemistry, Head of the department - Honored Worker of Science of USSR Sci. M. Malinowski), improved methods of coprecipitation (Department of Analytical Chemistry, Head - prof. V. Chuiko), the study of the mechanisms of electrodeposition of metals in the presence of PAHs, developing effective processes galvanotechnics (Department of Physical Chemistry, Head - Honored Worker of Science of Ukraine prof. Yu. Loshkariov). Today at the Faculty there are 5 departments. Thay all run a wide range of scientific research in analytical, inorganic, organic chemistry, electrochemistry, chemical engineering. There are 8 lecturing auditoriums and more than 50 specialized laboratories, 4 teaching classrooms, 2 computer labs equipped with modern technology at the faculty; all the students are welcome to use Internet. Dean of the faculty - Varhalyuk Victor Fedorovych, Doctor of Chemistry, Professor, Honored Scientist of Ukraine, excellent employee of education in Ukraine. Dean of Academic Affairs - Kopteva Svitlana Dmytrivna, PhD, associate professor. Deputy Dean for Research - Kondratyuk Natalia Vyacheslavivna, PhD, associate professor. Dean of educational work - Shevchenko Luydmyla Vasylivna, PhD, associate professor. Graduates of the Chemistry Faculty have the opportunity to work as teachers in universities, research institutes and laboratories, chemical, pharmaceutical and food companies as head of chemical and industrial laboratories, engineers, chemical engineers, chemists, analysts, department heads, etc. For the students enrolled in specialization "Food Technology", the university has created conditions and basic platforms for having a practice of the study, educational, industrial, engineering, technology and production practices at the base of enterprises and organizations. Among them are the following - TPG "Rainford", LLC "Corporation"Fanny", LLC "Sardonyx" stock company "Combine Pridneprovsky", JSC "Natalie", OJSC "Dnipro hladokombinat", OJSC "Snigovik" and other food industry and restaurant business. On the basis of the research center at Pavlograd Chemical Plant for students enrolled in "Chemistry and Engineering" there are all conditions to perform works on specific subjects, following undergraduate and production practices. Other basic enterprises for internships are companies "Star" and "Impulse" (Shostka), Petrovsky plant (Petrovsky, Lugansk region). Practices related to performance of research are conducted at the Institute of Macromolecular Chemistry, Academy of Sciences of Ukraine (Kyiv). These companies and organizations are potential employers for our graduates. At the Faculty of Chemistry there are three schools. The oldest is the School "Epoxy" which was founded in the 1950s. The founder of the school was honored worker of science and technique of Ukraine, Doctor of Chemistry, Professor Michael Sergiyovich Malinowsky - gifted scholar and teacher, most of his work was connected with epoxides. M.S. Malynovsky with staff in a range of fundamental research results in the reactivity of epoxides, developed promising new methods of synthesis of these substances. Today the work of Malinowsky M.S. if continued by the successful education worker of Ukraine, Doctor of Chemistry, Professor Sergiy Ivanovich Okovyty. Over the years of work of epoxides school, its employees have presented 4 doctoral and more than 40 master's theses, received 60 patents for inventions, published 5 books and over 500 scientific articles. 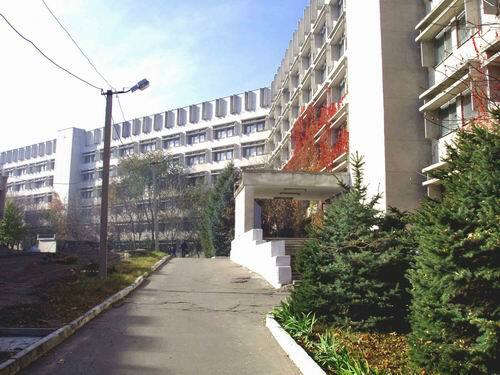 The School "Electrodeposition and corrosion protection of metals" at the Faculty of Chemistry was founded in 1970 under the leadership of Honored Worker of Science of Ukraine , academician of the Academy of Sciences of Higher School of Ukraine, Doctor of Chemistry, Professor Loshkarov Yuri Mikhailovich. Among the priorities of the school are the study of the kinetics and mechanisms of electrode processes in the presence of surfactants, electroplating of new technologies in production, manufacturing of anodes and electrolyte supplements. Today the work is continued by the Honored Worker of Science of Ukraine, Doctor of Chemistry, Professor Varhalyuk Victor Fedorovich. Over the years the school prepared 3 doctors and 28 candidates of sciences, published more than 700 scientific papers. The youngest at the faculty is scientific School "Analytical chemistry of low concentrations" which was founded in 1994 - by Honored Worker of Science of Ukraine, Doctor of Chemistry, Professor Chmylenko Fedor Olexandrovich and Excellent worker in Education of Ukraine, Doctor of Chemistry, Professor Tsyganok Ludmila Pavlivna. Among the priorities of the school are the study of the theory of measurement and analytical information signals and its practical application to intensify the analytical process of physical action; intensification sample preparation in the analysis of food, soil, biological and medical facilities; development and construction of ion-selective electrodes, development of theoretical foundations of purposeful usage of chemical-analytical properties heteropolicompounds. Over the years the school trained over 4 doctors and 40 candidates of sciences, published about 600 scientific papers, 5 books, received more than 70 patents, a number of state standards for the determination of impurities of heavy metals in food. The research process at the Faculty makes four fundamental state budget issues, the implementation of which is attended by about 20 teachers and scholars of Chemistry Faculty. Employees of the Faculty are actively co-operating with universities, research institutions and enterprises of Dnipro, Kharkiv, Kyiv, Odesa and other cities of Ukraine. As part of cooperation agreements in education and science for graduates, Chemistry Faculty continues studies at the Master's and postgraduate higher education institutions in Europe and United States. Thus, for nearly a decade Chemistry Faculty employees actively work with scientists of the State University Jackson (USA) in the field of chemistry and computer technology, as a result - five graduates of the Chemistry Faculty (Podolyan Eugene, Alexander Isaev, Furmanchuk Elena, Jana Holod and Tatiana Petrova ) completed postgraduate studies at the institution; teachers and graduate students of organic chemistry are trained annually at the university, have dozens of joint scientific papers, participate in joint research projects. Besides, graduates successfully work in the specialty in Germany, Britain, Israel, of Denmark, USA. Students and graduates of the Chemistry Faculty are actively involved in national and international academic programs («ErasmusMundus», Fulbright Foundation) and scientific exchange. Students and graduates of the Chemistry Faculty have been trained at the Faculty of Chemistry, University of Oxford, UK (Sadkova Irina, Velychenko Julia), University of Vienna, Austria (Chuchupal Julia) and Jackson University, USA (Shovkoplyas Kira) under grant programs of the Ministry of Education and Science of Ukraine. Students of Chemistry Faculty annually take part in the National Olympiad in chemistry and Ukrainian contest of scientific works "Chemical sciences". Traditionally each year among the students of chemical faculty there is a number of registered scholars (scholarships by the President of Ukraine, Verkhovna Rada of Ukraine, the mayor, the Academic Council of Dnipro etc.). During the period of 2006-2015. Among students of Chemistry Faculty there are 11 winners for the scholarship program "Zavtra.UA", charitable organization "Victor Pinchuk Foundation".